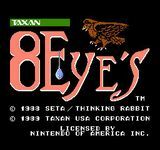 8 Eyes features a cooperative mode in which one player controls Orin and the other player controls Cutrus. In the single-player mode, the player has limited control of both characters simultaneously, making the game significantly more difficult. Source: Wikipedia, 8 Eyes , available under the CC-BY-SA License.